My absolute favorite horror isolation audio drama. Good acting, writing, and sound production. Plus scary of course. Recent mining excavations led to the discovery of a small descending hole beneath the city, aptly titled The Narrow. Listen to uncover what we know so far. This week is not an episode of the White Vault. This is an interview episode with the voice of Dr. Karina Schumacher-Weiß, Kessi Riliniki! The White Vault will return on January 8th. Thank you for your understanding that as a two-person podcast team we need a brief holiday break. In this episode we discuss the origins of the Krampus mythos, Wolpertingers, Bavarian Folklore, discovering black doors in basements, and haunted board games in floorboards. A collapse in the cave system leaves the team stranded in the underground village. As they locate more information on the fate of Walter Heath, they also must search for a way to save themselves from the prison of ice. The team rushes to follow the trail of an abducted Walter Heath. Faced with no other options, the team departs outpost Fristed in the middle of the storm. With their food supply destroyed, the team must choose between braving the white wastes or enduring starvation in the bunker. We return to Svalbard right where the last season left off. Following the previous installment, the assessment and repair team decide upon actions to take following the abduction of Karina. Sound design by Sarah Buchynski. This is a collaboration between Fool and Scholar Productions, and Polarity Audio Works, copyright 2018. You can hear more of Peter on the NoSleep Podcast or on his website. We at Fool & Scholar Productions have some announcements about The White Vault as well as a trailer for our new Supporter-Exclusive show - Artifact. Meet Marion Sutton, a doctoral student at the University of Oxford. She has been assigned to begin the research on an artifact given to the university by an anonymous donor. Artifact is written by K.A. Statz, co-produced by Pacific S. Obadiah & Travis Vengroff, and stars Tanja Milojevic, in addition to a full voice cast. During the break we'll be working on the Liberty Podcast. Tensions rise as Karina's sleepwalking endangers the lives of the team and new disturbing voices are picked up on the station's transmitter. The team awakens to a mysterious scratching sound outside their bunker. Still stranded in the white wastes and ongoing storm, they ponder what could be capable of creating such a noise. The White Vault is sponsored by Klipsch! Stuck inside the bunker, Karina's condition worsens while the rest of the team discovers more about the mysterious stone object and the strange transmissions. We discover more about Karina's condition while the rest of the team excavates a new area of the underground village. Join us as we discuss The White Vault, and hear two genuine Icelandic folktales told to us the one and only voice of Jónas Þórirsson, Eyþór Viðarsson! Hems's Podcast "The Lucky Die"
iTunes for "The White Vault"
Podchaser for "The White Vault"
While attending to a mishap in the underground village Mr. Heath makes contact and receives an unknown radio signal. 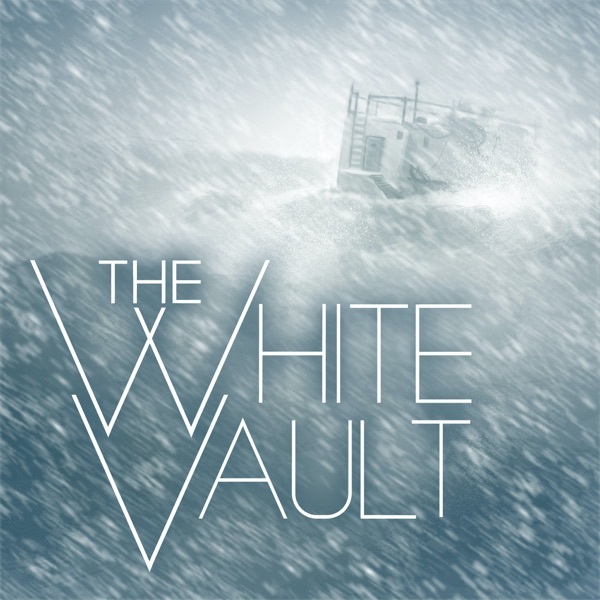 Explore the far reaches of the world’s horrors in the audio drama podcast The White Vault. Follow the collected records of a repair team sent to Outpost Fristed in the vast white wastes of Svalbard and unravel what lies waiting in the ice below. Our premiere episode introduces our international team to the cold fields of Norway’s distant island, Svalbard. They head out for their small haven in the snow, Outpost Fristed, just as a storm settles in. Prepare for the opening of The White Vault. Premiering October 3, 2017, The White Vault is a horror audio drama podcast following the collected records of a repair team sent to Outpost Fristed in the vast white wastes of Svalbard. Sample the voices and horrors of the upcoming podcast, The White Vault, in this short teaser trailer.